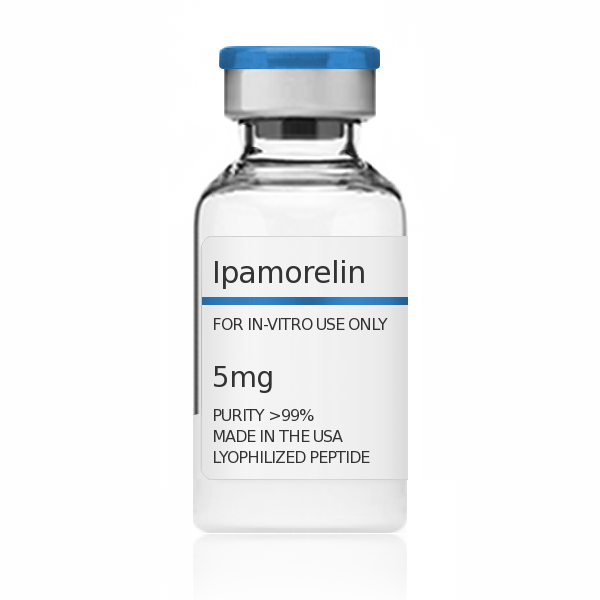 Ipamorelin is a more recently developed synthetic GHRP (growth hormone releasing peptide) that exhibits strong (GH) growth hormone releasing properties. In specific rats, Ipamorelin released GH with a potency and efficacy comparable to GHRP-6. The same study reported that Administration of both GHRP-6 and GHRP-2 resulted in increased plasma levels of ACTH (adrenocorticotropic hormone) and cortisol. It was noted that ipamorelin did not release ACTH or cortisol in levels significantly different from those seen following GHRH administration, even at very high doses. This study concluded by saying that ipamorelin is the first GHRP-receptor agonist with a selectivity for GH release similar to GHRH, making it a very interesting candidate for future clinical development. GHPeptides™ Ipamorelin has a peptide purity level that exceeds 99.0% as determined by HPLC. This peptide was synthesized with no additives and is supplied as a white lyophilized (freeze-dried) powder. It is recommended to reconstitute the lyophilized Ipamorelin in sterile water, which can then be further diluted in other aqueous solutions. Lyophilized Ipamorelin although stable at room temperature for 3-4 weeks, should be stored desiccated below -18°C. Upon reconstitution, Ipamorelin should be stored at 4°C out of direct light for between 10-14 days and for future use below -18°C. Prevent repeated freeze-thaw cycles.